One of the many perks of being a wedding photographer is getting to do fun things like riding a chairlift and taking photos. 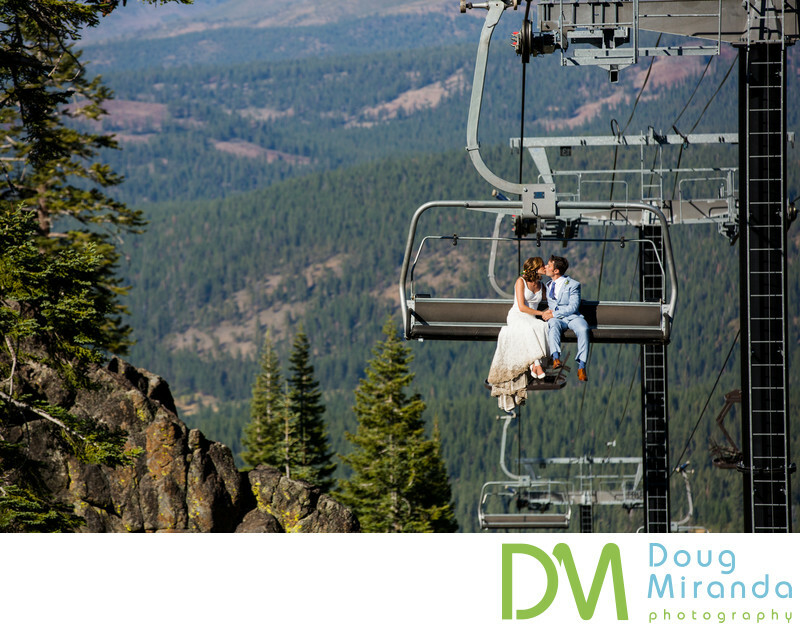 In this picture the newly married couple is riding up a chairlift while kissing each other. The backdrop is just amazing with a mountains and forest as far as you can see. Zephyr Lodge at Northstar is nestled on the top of the mountain at 8000 feet. It’s located right on the ridge and has amazing views of the valley and the rest of the Sierra mountains north of Tahoe. It’s an adventure just to get to the lodge. You’ll have to take two gondola rides up from the base of Northstar Village. You’ll be treated with stunning views of the mountain on your way up. Once you get to the top of the mountain it’s a short walk down the path to the lodge and ceremony site. The ceremony site is located right next to the lodge and is only steps away from the entrance. 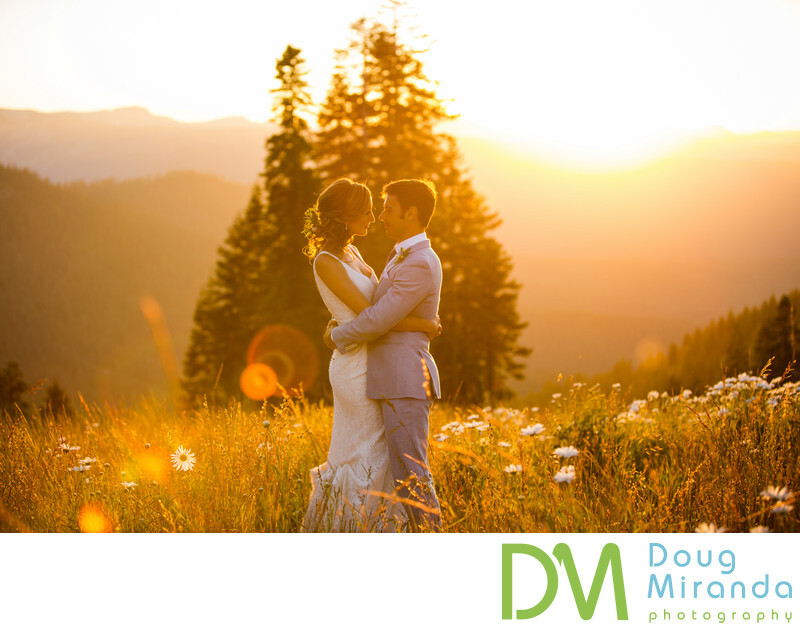 Your ceremony will take place right on the edge of the ridge which will give you and your guest unobstructed views of the Sierra Nevada Mountain range while you exchange your vows. There is no other ceremony site like this in all of the Tahoe region. After walking back down the aisle has husband and wife your reception and dinner will take place inside the massive Zephyr Lodge. With huge windows covering most of the lodge you’ll still have those great views while being inside the lodge. The lodge has giant open floor plan, so that it can accommodate lots of guest and a dance floor. There is also a huge deck out back that has those same amazing views and is where your cocktail hour will take place and mingling can happen after dinner and during dancing. Zephyr Lodge is definitely one of the most unique and sought after wedding venues in Lake Tahoe and the Sierra Nevada Mountains. Vendor escorts up the mountain. Wood folding chairs for ceremony. On site transportation to other locations. On site professional event planner. Invitation for four people to preview wedding and grand tasting. Can accommodate up to 300 guests. Outdoor and indoor ceremony and reception services. Location: 5001 Northstar Dr, Truckee, CA 96161. Keywords: Zephyr Lodge Northstar Wedding (24).